The Mali 100, Presented By Afropop Worldwide Mali is currently a country in crisis. Yet this West African country boasts one of the world's richest musical traditions, and iconic artists like Ali Farka Toure, Salif Keita, Oumou Sangare and Tinariwen. With help from our friends at Afropop Worldwide, we selected 100 songs that demonstrate Mali's musical breadth. 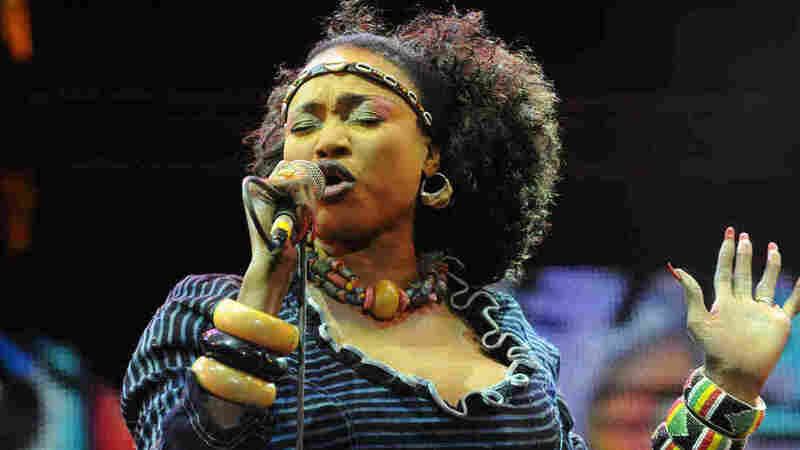 Malian singing legend Oumou Sangare performing in Essaouira, Morocco in June 2012. Since January 2012, the vast West African nation of Mali has been in crisis. Formerly considered a stable democracy, Mali has become embroiled in a complex conflict involving a military coup d'état in the capital city of Bamako, a separatist rebellion in the desert north, and a bewildering power struggle among Islamist and criminal elements of undetermined national origin. French forces allied with other African nations are battling insurgent and Islamist fighters in the remote mountains and deserts of the sparsely populated Malian north. This fight will not be resolved quickly or easily, and even when it is, political and territorial challenges — not to mention the tragedy of hundreds of thousands of displaced citizens — are likely to remain for many years to come. Yet this proud nation's history extends far beyond the current crisis. Afropop Worldwide, hosted by Georges Collinet and distributed by Public Radio International, has compiled a set of 100 songs that reveal the deep cultural richness of this remarkable country. Recent events in Mali are particularly shocking because it formerly stood as a beacon of democracy in the region. Mali's fundamental inter-ethnic harmony goes back to the 13th century Malian Empire, a peaceful, multi-ethnic regime that thrived across much of West Africa for 200 years. This history is reflected in Mali's rich palette of traditional music. Since its independence from France in 1960, many of these traditions have developed into spectacular popular music genres — the desert blues-rock of the Tuareg and Songhai people in the north, the august praise songs and instrumental virtuosity of the Mande griots (musical historians designated by birth), the loping swing of Wassoulou music from the south and a rich array of pentatonic genres. Vocals range from Delta blues-like grit to near operatic refinement, and the instrumental brilliance expressed on a range of harps, lutes, and wooden-slatted balafons has found its way onto guitar frets and keyboards as the country has embraced Western instruments and influences without losing an ounce of its striking local character. This trend continues right through the emergence of Malian singer-songwriters, rappers and electronic music mixers. Since its inception on public radio on 1988, Afropop Worldwide — and, since 1997, its companion website, afropop.org — has been deeply committed to exploring the seemingly endless varieties of entrancing music in Mali. Afropop producers have collectively made seven field research trips to the country. They've sometimes spent months there, visiting remote locations and building close relationships with artists. Many of these artists have built loyal international followings and delighted American audiences. 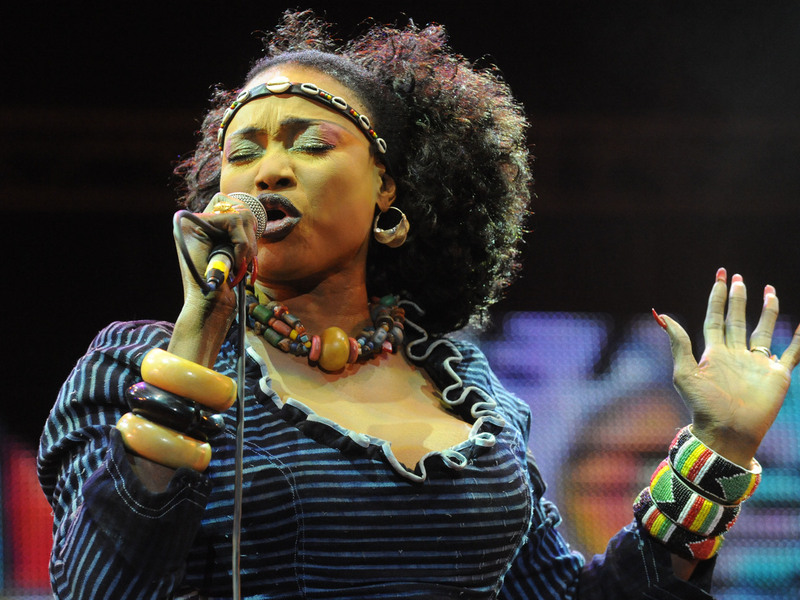 In fact, no other African country can boast having as many artists signed to US record labels or touring agencies: Salif Keita, Toumani Diabaté, Oumou Sangaré, Ali Farka Touré, Tinariwen, Habib Koité, Rokia Traoré, Bassekou Kouyaté, Fatoumata Diawara and others. The 100 songs on this channel, compiled with input from Christopher Kirkley of the blog and label sahelsounds, only scratch the surface of Mali's musical treasures. Despite inevitable omissions, this stream provides a representative introduction to the country's key regions, genres and artists, and a powerful reason to care about Mali's fate as it faces profoundly difficult times. For more on Malian music, visit afropop.org. Bassekou Kouyaté & Ngoni ba, "Falani"
Bassekou Kouyaté & Ngoni ba, "Musow (For Our Women)"
Djelimady Tounkara and Adama Tounkara, "Kouyaté/Diaoura"
Rail Band, "Duga (Bambara Version)"
Sidiki Diabate/Batouro Sekou Kouyaté, "Sunjata"
Toumani Diabaté's Symmetric Orchestra, "Toumani"
Amadou & Mariam feat. Manu Chao, "Sénégal Fast Food"
Mali Latino (Madou Sidiki Diabaté, Ahmed Fofana, Alex Wilson), "Donkan"
Steve Reich, "Electric Counterpoint" (mps PILOT's Future Takamba Remix)"
Bela Fleck (with Oumou Sangaré), "Djorolen"
Kokanko Sata, "Tata Kan to Gnonkon Ye"
Neba Solo, "Vaccination (edit version)"
Zani Diabaté, "Ni Zani Mana"
Zani Diabaté & the Super Djata Band, "Super Djata"
Habib Koité & Bamada, "Nanale"
Lobi Traoré, "Moussa de Konina"
Taj Mahal and Toumani Diabaté, "Kulanjan"
Taj Mahal and Toumani Diabaté, "Ol' Georgie Buck"
Voices United for Mali, "Mali-Ko (Peace /La Paix)"
Ali Farka Touré, "Goye Kur"
Ali Farka Touré, "Red: Timbindy"
Baba Salah with Andra Kouyaté, "Dangay (The North) [Mali]"
Ry Cooder & Ali Farka Touré, "Diaraby"
Sidi Touré, "Ni see ay ga done (It is to You that I Sing)"
Super 11, "A Fizou Toure"
Vieux Farka Touré, "The Secret (feat. Ali Farka Touré)"
Mamy Star fr. Assourita, "Awn D Niogont"
Georges Collinet, born in Cameroon, is one of the best-known and best-loved broadcasters on the African continent. Known to his fans as "Maxi Voom Voom," Georges' French and English language music programs on the Voice of America have attracted millions of listeners. Throughout his career, Georges has played a key role in connecting the U.S., Europe and Africa. Georges worked with African musicians in Paris during the 1970s and early '80s, supporting their efforts to retain African roots in their music and to develop a distinctive, professional sound. Since 1988, he has hosted PRI's Afropop Worldwide, the award-winning series heard on public radio throughout the U.S., Europe and Africa. Sean Barlow is the creator and executive producer of Afropop Worldwide from PRI, the first nationally syndicated radio series on contemporary African music. Sean did the initial fieldwork for the series in 1985 in Ghana, Cameroon and Zaire and has since done research widely on the continent and in the Americas. He has also co-produced Afropop book, film and festival projects. He created the Afropop Hall of Fame, to honor exceptional artists and music advocates. In 2012, he co-produced the Musicians for Mali benefit in NYC that raised funds for musicians fleeing the chaos of the north. Banning Eyre is an author, guitarist, radio producer, journalist, and senior editor at afropop.org. His work with the public radio series Afropop Worldwide has taken him to over a dozen African countries to research local music, especially guitar styles. He comments on world music for NPR's All Things Considered. He is the author of In Griot Time: An American Guitarist in Mali, and has just completed a new book about Thomas Mapfumo and the history of Zimbabwe. Christopher Kirkley is a music recorder, archivist, and self-proclaimed "guerilla ethnomusicologist" focused on the Sahel and Sahara of West Africa. His work spans field recording, cultural archiving, experimental ethnography, and the role of new media in West Africa. He has a produced an extensive discography of record releases under the label Sahel Sounds in conjunction with artists across six countries, from field recordings of small town rock bands to self produced local rap artists. He maintains a blog exploring arts and music of the region. Anastasia Tsioulcas is a producer for NPR Music who writes and reports about world and Western classical music. With specialties in North and West African music as well as music of South Asia and the Middle East, her work has appeared in publications and websites as diverse as NationalGeographic.com and Travel & Leisure. Prior to joining NPR Music, she served as a commentator about North and West African music for several public radio programs, including "The World" (BBC/PRI/WGBH), "The Savvy Traveler" and "Weekend America" (APM), and she appeared regularly for many years on WNYC's "Soundcheck."